p.s. I'm also over at Ashley Nicole Catherine today sharing my love for all things girly and pink. Check it out here. Love that ring!! great cocktail picks!! Gorgeous look! That dress is beautiful and the YSL lipstick shade is so elegant! Love this! Can't wait to see what you wear to the actual wedding too. Love orange & turquoise together. Such a fun combo for summer. Can't wait to see what you end up wearing! Achei lindo. Eu amo laranja e essa combinação ficou perfeita! Muito bacana seu Blog! Bjs! That sounds like a fun trip! I love this look!! Very Cartegena! I've always been a huge fan of orange & turquoise together... I've always also been envious of people who go to University of Texas because they could totally pull off that color scheme at games. Grr screw purple sometimes! Dang Horned Frogs and their purple color!! Ha sorry getting off topic... anyway, love your picks & that dress would be so pretty on you with your olive complexion! 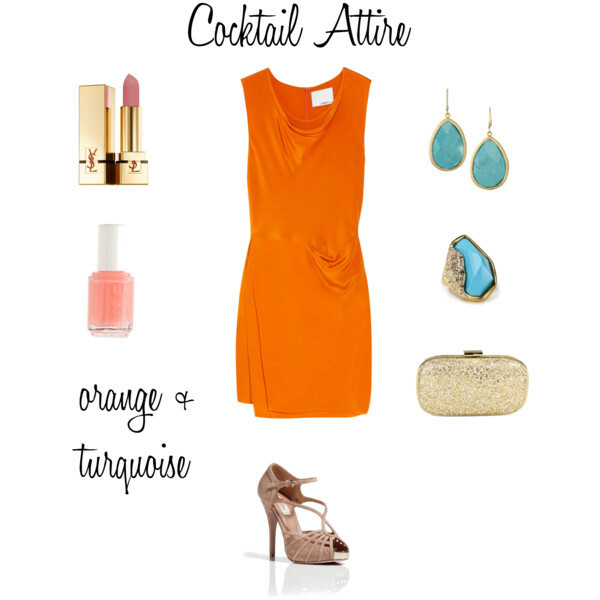 Love the orange dress with the turquoise combo - beautiful! I adore orange and turquoise together! This would be perfect for a summer rehearsal dinner. Thanks for commenting on my blog:) I'm your newest follower!